It is now 3:21 PM HAT Time on Sunday, April 21, 2019. Relay Online Registration closed at 11:59 PM on Sun, Mar 18, 2018. Sanctioned by Greater Indiana LMSC for USMS, Inc. Date: The 2018 USMS 1-Hour ePostal Nationals must be swum in its entirety from January 1 to February 28, 2018. Swim the event first, then register for the 2018 USMS 1-Hour ePostal Nationals. For your convenience, have your completed split sheet handy to enter your splits at the prompt. Entries must be submitted electronically via ClubAssistant.com by 11:59PM local time on March 1, 2018. Age will be determined as of 12/31/2018. Results will be compiled accordingly. All online individual entry submissions must be completed by 11:59PM local time on March 8, 2018. Completed split sheets for individual National Record breakers only must be received by the event director by March 8, 2018. All online relay entry submissions must be completed by 11:59PM local time on March 18, 2018. Objective: To swim as far as possible in one hour in any pool you choose that is 25 yards or longer. Event results are sent in electronically so you can compare yourself to other swimmers doing the same event. Some people do the 1-Hour ePostal event for competition, while others do it for fitness; all who wish to participate are welcome. The recorded distance (total yards swum) that you submit determines the order of finish. If two or more swimmers report the same distance, a tie will be declared. Location: Swimmers shall swim the 1-Hour ePostal in any pool 25 yards or longer. Please submit your splits and final distance in the course that you swam your event. For events swum in meter pools, the final distance will be converted automatically by the online entry system by multiplying the distance swum in meters by 1.0936 and then rounded down to the nearest five yard increment and integrated with the yard distances. For online entries for events swum in meter pools, please see the ONLINE ENTRIES section below. Eligibility: This is a USMS sanctioned event and all participants must be registered for 2018 with USMS (or the equivalent FINA organization for foreign swimmers) on or before the day of their swim. Online entries for USMS members will be verified automatically. Foreign swimmers are not eligible for USMS records or All American status. All foreign swimmers who enter online must submit an electronic copy or mail a copy of their equivalent organization 2018 registration card to the event director by March 8, 2018. Individual Events: Men and women compete separately in age groups of five-year increments: 18-24, 25-29, 30-34,…100+. PLEASE NOTE: The swimmer’s age as of Dec. 31, 2018 will determine his or her age group. (Reference: USMS rule 301.4: "In open water and postal swims, the eligibility of a swimmer shall be determined by the age of the swimmer on December 31 of the year of competition, except for 18-year-olds, who must be 18 on the day that they swim.") Therefore, each swimmer can only swim in one age group for the 2018 1-Hour ePostal National Championship. Fees: $7.00 for each individual USMS entry ($10.00 for foreign swimmers) and $15.00 for each relay entry. Fees are non-refundable. Online entries must be paid by credit card (Visa, MasterCard, Discover) to "ClubAssistant.com Events". The 2018 USMS Rules govern these events, including USMS Rule 102.12.1 regarding swimwear. Drafting, flotation, and propulsive devices (pull buoys, fins, paddles, snorkels, wet suits, etc.) are not permitted. No more than two swimmers may share a lane. If a lane is shared, each swimmer must stay on his or her side of the lane during the entire race (i.e. no circle swimming). An adult acting as a starter/head timer/referee shall be present at all times during the swim. Each swimmer must have a verifier to count laps and record cumulative splits every every two lengths of the pool. The timing of the event may be done with a stopwatch or electronic timing device. Distances are to be rounded down to the nearest completed five yard increment (i.e., round 2764 yards to 2760 yards). Online entries will be converted automatically from meters to yards if necessary. One person may serve as a counter for no more than two swimmers per heat. No adjustment may be made for swims completed at altitude. Splits/Timing: A stopwatch or electronic timing system shall be used to time the event. Cumulative split times must be recorded to the nearest second on the official event split sheet. CLICK HERE for PDF Split Sheet. This split sheet must be kept for each swimmer. (Final times for national records must be recorded to the nearest 100th second.) When a final time has been submitted to the nearest second, .99 second shall be added to the time submitted. When a final time has been submitted to the nearest tenth of a second, .09 second shall be added to the time submitted. Online Entries: When submitting your results online, please enter your total distance swum IN THE COURSE that you swam it and select the corresponding unit - yards or meters. You will then be asked to enter your 500 yard or meter cumulative split times for the 1-Hour ePostal. At the bottom of the page, your Official Distance will be displayed in yards rounded down to the nearest 5 yard increment. If you entered your total distance swum and your cumulative splits in meters, your Official Distance that will be displayed will have been automatically converted to yards and rounded down to the nearest 5 yard increment. Individuals entering online WILL NOT be required to submit a completed split sheet UNLESS that entrant has broken an individual national record. However, split sheets must remain available upon request of the event director; if it is not provided upon request, the individual entry and applicable relays may be disqualified. Please retain a copy of your completed split sheet for one year after the entry deadline. Group Entries: Group entries will be permitted for clubs with 30+ swimmers only. Clubs desiring to do group entries must contact the event director, info@indyaquaticmasters.com before February 20, 2018, and work with Club Assistant to enter their swimmers. Group swims should be swum so that all entries can be completed by the online entry deadline of March 1, 2018. There will be no exceptions to extend beyond this deadline. Completed split sheets for individual National Record breakers must be received by the event director by March 1, 2018. Scan and email to the event director info@indyaquaticmasters.com or mail to 2018 1-Hour ePostal National Championship, c/o Indy Aquatic Masters, P.O. Box 30145, Indianapolis, IN., 46230. Traditional awards: The first 10 finishers in each age group in the individual event and top 6 teams for relays will receive USMS Long Distance National Championship medals. Additionally, first place finishers in each individual and relay age group will receive a USMS Long Distance Championship patch. Only one patch per event per participant will be awarded. Non-traditional awards: Rather than receive a medal, we will send a $1 donation to the USMS Swimming Saves Lives Foundation in your name. We will email a photo of your award and the donation certificate. Designate your award preference on the entry sheet. 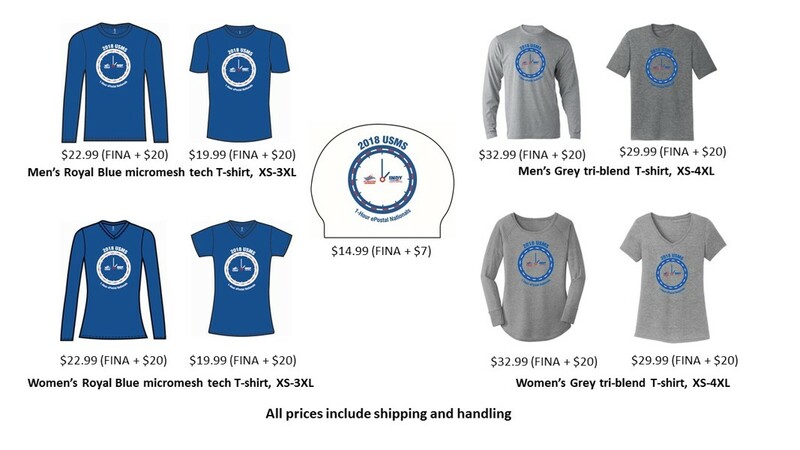 T-Shirts/Caps: 2018 USMS 1-Hour ePostal National Championship shirts and caps may be purchased during your online meet entry or separate from your online entry at this Shopping Cart link. The merchandise store closes Monday, March 19th. All prices include shipping and handling. Royal Blue Short Sleeve ($19.99) and Long Sleeve ($22.99) mesh tech t-shirts - A lightweight micromesh performance technical fabric with a soft feel providing exceptional moisture management. Men and Women Sizes XS - 3XL. Grey Short Sleeve ($29.99) and Long Sleeve ($32.99) tri blend t-shirt - A buttery soft tri blend t-shirt with a regular, relaxed fit that is lightweight and breathable. 50/25/25 poly/ring spun combed cotton/Bamboo Rayon. Men and Women Sizes XS - 4XL. Latex Cap ($14.99) - A classic latex swim cap commemorating your 2018 postal swim. Secure fit and the perfect weight for practice or competition. International orders add $20 per t-shirt and $7 per cap. Results: Complete results will be available via the internet. Preliminary individual results will be posted for one week on the USMS website at www.usms.org by March 21, 2018, and preliminary relay results will be posted for one week by March 27, 2018. All corrections must be sent to the event director during that one week. Final results will be posted approximately one week later. An email will be sent to all participants when the preliminary results are posted for review. Relay Events: Relay events will be contested in three categories: 3 men, 3 women, or 4 mixed (2 men, 2 women). Each relay member MUST also enter the individual event and be registered with the same USMS Club. Unattached swimmers are not permitted on relays. Participants shall be allowed to swim in only one same-gender and one mixed-gender relay event. The youngest relay member’s age shall determine the relay’s age group. Age groups are 18+, 25+, 35+,…95+. The cumulative yardage for the individual swims will be the relay yardage. Club Event: Each Club will be entered automatically in the Club event. At least three divisions will be recognized, based on the number of individual entries from each club, as determined by the event host and the Long Distance Committee Chair. Relay yards will not be included. Online Relay Entries: Online relay entries will open on March 10th, 2018. All online individual entries will be displayed by USMS Club and will include the entrant's yardage for the Club Relay Coordinators/Builder's reference. You will only be able to view a listing of YOUR CLUB'S USMS entries. Online relay entries must be completed by 11:59PM HAT on March 18, 2018. Questions: Contact Mel Goldstein, Event Director, info@indyaquaticmasters.com, (317) 537-7946. Online Registration closed on 3/8/2018.